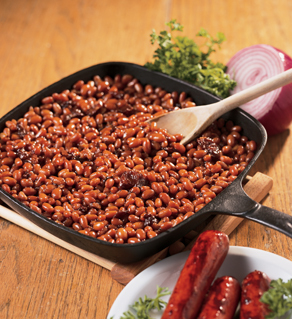 Original Firehouse OVEN-BAKED BEANS with BACON is Captain Ken’s signature, made-from-scratch, bean recipe. It was perfected at Fire Station House #14, in St. Paul, MN, where the company’s founder, Ken Freiberg was Captain. The beans were first served at the Minnesota State Fair in 1963. They are made with the finest Grade A navy beans, lots of bacon, rich molasses, brown sugar, and spices, then slowly oven-baked (not canned) using a process that has made Captain Ken’s baked beans famous for gong on 50 years! 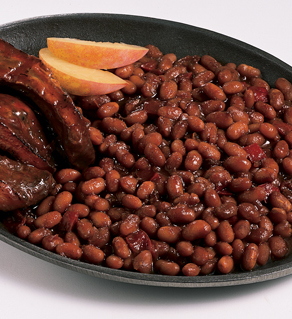 Captain Ken’s BAKED APPLEBEANS with PECANS is an incredibly great tasting bean recipe. It combines Captain Ken’s famous oven-baked beans with specially seasoned apple pie filling. Serve with pork chops or BBQ ribs. You’ll never find a better combination. This side-dish is equally suited for white-table cloth restaurants as backyard barbeques. Because of it’s sweet flavor, we sometimes refer to this recipe as our “dessert of beans”. Guests will be wowed. Captain Ken’s BAKED APPLEBEANS (No Pecans) is the same great tasting recipe as our Baked Applebeans with Pecans, just no pecans. It combines all the same premium ingredients to make this recipe a special treat for guests. When heating, a special treat is to keep the product in the oven until the recipe begins to slightly caramelize. Unique and delicious. Another favorite from the Captain. GRAMMA D’s BAKED BEANS (a.k.a. “Calico Beans” or “Three-Bean Casserole”) can be a meal by itself. This recipe offers a savory combination of navy, kidney, and butter beans, with generous portions of bacon, onions, aged cheddar cheese, and spices. And like all Captain Ken’s bean recipes, the beans are oven-baked (not canned), which gives the beans their texture and homemade touch. 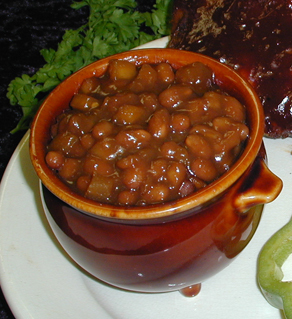 Captain Ken’s BAKED BEANS IN BBQ SAUCE with SMOKED PULLED PORK is ideal for those consumers and operators wanting to serve a premium barbequed baked bean. Like all of Captain Ken’s bean recipes, these beans are slowly oven-baked (not canned). We then add our made-from-scratch thick and rich barbecue sauce, special seasonings, and generous amounts of naturally smoked pulled pork. Serve at your restaurant or picnic by the lake. If you are looking for a premium barbeque bean with no meat, look no further. Captain Ken’s BAKED BEANS IN BBQ SAUCE is made with the same premium ingredients and proprietary made-from scratch barbeque sauce as used in our Baked Beans in BBQ Sauce with Smoked Pulled Pork, plus the same care and attention to detail. And worth repeating, these beans are made-from-scratch and oven-baked. Minna’s Homestyle VEGETARIAN OVEN-BAKED offers vegan consumers a premium baked bean alternative. This made-from-scratch recipe utilizes the secret cooking process of Captain Ken’s famous Original Recipe Oven-Baked Beans including its’ slow oven-baked process. This recipe is free of High Frutose Corn Syrup and is low in fat, cholesterol, and sodium. Captain Ken’s ORGANIC VEGETARIAN OVEN-BAKED BEANS are made with organic navy beans from the Upper Midwest. To make, we first soak the beans overnight in natural well water . Just like all of Captain Ken’s made-from-scratch bean recipes. Other ingredinets (molasses, brown sugar, special seasonings) are added, then hand-stirred. After being oven-baked, they are packed in biodegradable packaging (not canned) and flash frozen to lock in flavor and homemade style taste and texture.